Are you ready to help make a difference in the greater San Antonio area this summer? Let us help! Starting May 1st, we are partnering with the San Antonio Food Bank to kick off the 2nd annual Lockaway Cares Food Drive. The Food Drive is happening all month long with the capstone Stuff-the-UNIT event taking place on June 2nd at Lockaway Storage on Culebra Road. This event will feature food, music, prizes and more. You can make non-perishable food and monetary donations at any Lockaway Storage San Antonio location throughout the entirety of the food drive. Talk with your friendly Facility Manager about how you can help us support the San Antonio community. The Lockaway Storage team donating to the San Antonio Food Bank. The idea to have a food drive started last year among a handful of team members. Sedric Hatnot, Facility Manager at Lockaway Storage near Randolph Air Force Base, and his assistant, Marcus Warren, were two of the originators of the food drive idea. When Sedric first started working at Lockaway Storage, his facility had an issue with low occupancy. He and Marcus brainstormed different ideas for how to raise these numbers, but their early ideas felt flat. They knew they had to dig deeper. Not long after, all 30 San Antonio area Lockaway Storage locations picked up the idea and made it a company-wide event that same year. “Everybody gets help. We help people who need food, and people who are in need. Then also people who need units and extra space to put their garage stuff, or maybe people who are moving. So everybody is getting their needs met,” Sedric said. Thomas Nannen, District Manager in San Antonio, participated in the company wide event last year and helped deliver their facility’s donations to the Food Bank. “The first reaction of the employees there, was that they were blown away. They weren’t expecting as big of donations as we had. They even made the comment that the first year a company doing it, it was more than they were expecting,” said Thomas. The success of last year’s event gave company leaders the motivation and momentum to not only make the food drive an annual event, but to also set the overall goal for donations to be over double than that of the previous year. This year, Lockaway Storage aims to raise donations to provide 100,000 meals for the San Antonio Food Bank. “I’ve already gotten response from team members like ‘Hey, can I start now?’ and ‘How do we go about doing this?’ I’m expecting a lot more this year. Don set a pretty high goal, but I think we’ll meet it.,” Ashley Montessoro, Human Resources Administrator, said. While many still focus on giving to the Food Bank in the form of perishable and non-perishable food items, Chloe Palacios, San Antonio Food Bank Food and Fund Drive Coordinator, said that cash donations are critical. If Lockaway Storage meets it’s donation goals for the 2018 Lockaway Cares Food Drive, we’ll fill every shelf you see in this picture with food. Most people think about donating food for the holidays during cold weather months. However, more than 200,000 children in San Antonio are at risk of going hungry during the summer months, because they don’t have access to free and reduced breakfast and lunch at school. One such family who was able to benefit from the San Antonio Food Bank years ago happens to include someone who was a catalyst for getting the Food Drive started at Lockaway Storage. Sedric’s dedication to giving back to the community through Lockaway Storage has helped define our company as not only a great place for storing belongings, but an asset to the communities surrounding it. We are so excited to have all the San Antonio area Lockaway Storage facilities on board for this year’s food drive. 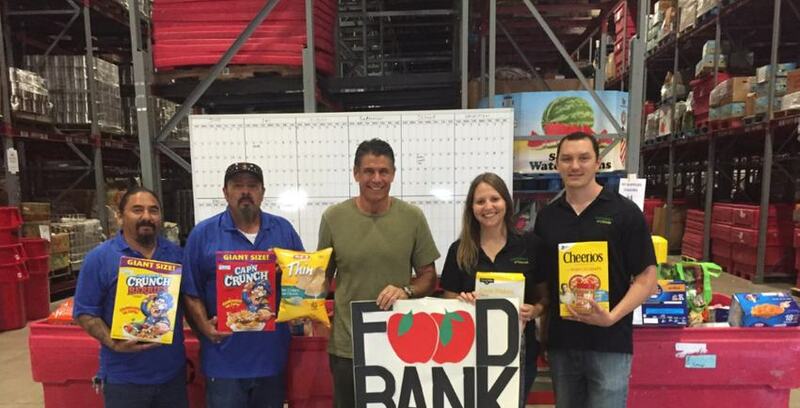 We know this is going to be a fantastic summer for the San Antonio Food Bank!